Ma’s prominent career has spanned over multiple decades in a variety of roles. Most notably as a cellist, he has released more than 90 albums, won 19 Grammy Awards, and collaborated with a variety of other notable artists. He has also served as a United Nations Messenger of Peace since 2006 and on President Barack Obama’s Committee on the Arts and Humanities in 2009. Through Silkroad, a not-for-profit organization Ma founded in 1998, Ma has worked to increase cultural collaboration by bringing together musicians from across the world. Ma has also twice been a Montgomery Fellow at Dartmouth, visiting campus in winter 2001 and spring 2018. 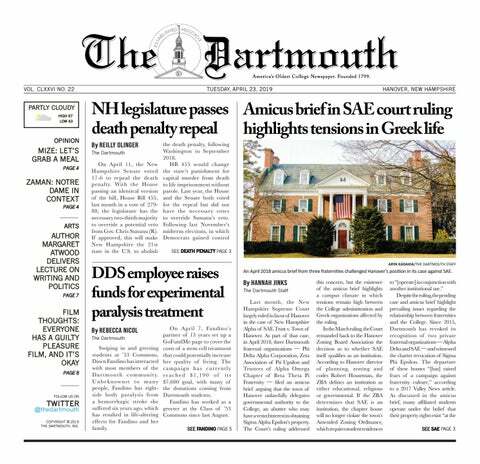 While at Dartmouth in the spring, Ma met with students, delivered a lecture to the public in Spaulding Auditorium and headlined in a performance with The Silk Road Ensemble. Ma’s work has earned him multiple honors, including the Presidential Medal of Freedom, the National Medal of Arts, the Avery Fischer Prize, honorary degrees from Princeton University and Harvard University, and the Fred Rogers Legacy award for his work advancing children’s education. Dartmouth will also award honorary degrees to current senior adviser to baseball operations for the Oakland Athletics Richard “Sandy” Alderson ’69, astrophysicist and director of the National Science Foundation France Córdova, executive director and co-founder of the International Refugee Assistance project Rebecca Heller ’05, environmental attorney Hilary Tompkins ’90 and architects Billie Tsien and Tod Williams, who were responsible for the recent renovation of the Hood Museum of Art. Alderson served as the general manager for the Athletics from 1983 to 1997. Under Alderson’s tenure, the Athletics won the World Series in 1989. After stints in the Major League Baseball’s commissioner’s office and as the chief executive officer for the San Diego Padres, he was named the general manager of the New York Mets after the 2010 baseball season. Under his leadership, the team reached the 2015 World Series. A history major during his time at the College, Alderson was a member of Sigma Alpha Epsilon fraternity and Dragon senior society. Córdova, who has served as NSF director since March 2014, was the 11th president of Purdue University. From 1993 to 1996, Córdova was the youngest person and first woman to be NASA’s chief scientist, and in 1996, she was a recipient of NASA’s highest honor: The NASA Distinguished Service Medal. Heller, a government major at Dartmouth, started a project called Harvest for the Hungry — which addressed food security issues in the Upper Valley — during her time at the College and was one of six students nationwide to win the Campus Compact Howard R. Swearer Student Humanitarian Award. She was the recipient of a MacArthur “Genius” Fellowship in 2018. A fellow government major, Tompkins served as the solicitor for the U.S. Department of the Interior from 2009 to 2017 after serving as counsel to New Mexico governor Bill Richardson (D) for five years. Tsien and Williams are a husband-and-wife duo who began working together in 1977 and co-founded their firm in 1986. In 2013, President Barack Obama awarded both of them the National Medal of Arts. The duo began work on the $50 million renovation and expansion of the Hood in 2016, and the doors opened to the public this January.